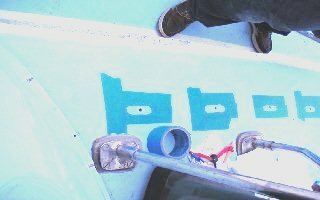 As the tedious process of insuring that water is prevented from entering Sea Quill, through the various deck mounted fittings, continues, I decided to tackle the grab rails for now the second time since 1991. The first was more to seal them from the outside. That attempt failed within months. It seems that this boat has had a history of constant leaks originating at the base of the exterior grab rails. Perhaps the old nemesis of the inconsistently-cored void in the coach roof is, once again, plaguing her and her skipper I thought. This season I had to replace the dodger. The effort was more driven by the fact that the custom instrument pod/sea coaming we had installed now needed the lower, horizontal, dodger panel significantly modified to fit properly. The price to repair the various stitching, replace the window panels and make the panel modifications versus replacement was almost the same and so the new one was designed. In doing so, I figured that the last, aft-end hand hold in both the exterior grab rails could be eliminated (leaving the interior length as is it was). By shortening the overall length only about fifteen inches, the new dodger would not have to be relieved (cut) around the grab rails the result to force much of that infrequent water to be diverted away from this annoying, potential entrance to the cockpit and the below decks spaces. At first it seemed a fairly easy job that would satisfy one of my most historic and irritating gripes. The can of worms it would open would have to be to well executed to cure this barrage of leaks once and for all. The exterior rails are fastened with # 14 X 4", bronze wood screws that pass vertically through the interior rails, through the liner, the void, the coach roof and ultimately screwed into about one-inch of teak near the top of the exterior rail. These screws are slot-headed and once the 3/4" teak plugs had been removed, the slot heads are seated so far up into the interior rail that just getting my "Big Mow-Moo" slot headed screwdriver squarely into the fastening was hindered by the still-clinging, old sealant within the hole and the hidden, remaining blobs of the wood glue that held in the teak plug. 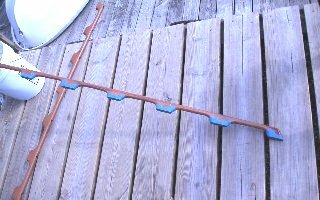 Added to that, the rather inaccurate drilling angles through the various layers of wood, previous sealants and fiberglass, the removal became a major task to accomplish without splitting the old teak rail. Two of the screws finally had to be cut by slipping a hacksaw blade between the coach roof liner and the foot of the interior rail. But, be that as it may, the rails finally relinquished to much tedious attention, a heat gun and a constant stream of cuss words. 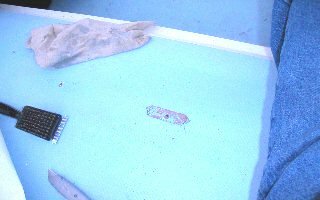 The jade green powder surrounding the bronze screw, curiously only near the measured depth of just below the deck surface, on almost every one of the screws, clearly indicated that water had indeed been running past the mating surface. Only two of the twenty showed water entering the cabin at the interior mating surface. Obviously the water was migrating into the liner and exiting at its favorite place, the outboard lip of the liner. Once again my Oreos and Ritz crackers stowed in the waist lockers were the hapless victims. The four rails went into my shop and were stripped, sanded and refinished. The exterior units were refinished with Cetol Light, sealed with the Cetol clear finish coat and the interior rails treated with many coats of Minwax, Helmsman, satin finish polyurethane. The first problem became evident almost immediately; the screw heads were now quite tool-worn and replacements in that size are not easy to find. I was particularly uncomfortable with re-installing the rails with slot-headed screws so I searched for the more "installation friendly" Phillips heads to no avail. Salvation finally came when I located # 14 X 4", stainless, square-drive, screws on the web (McFeeley's) ... of course the minimum amount was 100 units when I only needed about twenty. Once the first problem of the hardware was set aside I decided that the sealing process required a solution that would eliminate repeating this involved process for some years to come. The first decision was which sealant to use. GE-5200 was simply too adhesive and the risk of breaking the teak upon the next removal was simply too high. The most material-friendly and less expensive choice was Boat-Life poly-sulphide. It adheres well to wood and maintains a high degree of flexibility for a long time. With potentially good surface preparation to the cross-hatched, non-skid deck mating surface it would bond to the fiberglass quite well also. The issue of flexing decks and the fierce side loads often placed upon grab rails required that the flat surfaces of both the foot of the rail and the deck seemed destined to traditional failure once again. I would need to create a bit more bonding surface as well as be certain the screw hole was, independently, well sealed. This was accomplished by countersinking into the foot of the exterior rail to about a 1/2 inch depth. The "pocket" it would create would hold the intended glob of sealant and also provide it a direct bond with the intended blob to be squirted into the hole to form a significant plug for the screw hole. The flat mating surfaces would have a separate and significant sealant surface area applied to provide the first line of defense in the ingress of water. The more or less separate pocket/plug of sealant would insure the screw hole a separate and more water-tight integrity than the previous arrangement. Once the cold weather broke it was back out to the boat (conveniently docked behind the house) to prepare the coach roof for the installation. Again, the all-important preparation seems more important and time consuming than the actual installation. If secure bonding is to take place at the mating surfaces the more imperative issue is to properly clean any old sealant (and the previously over-brushed finishes) from the fiberglass. A bit of acetone splashed into a rag and set atop the mess, on each old footprint, allows the old residues to soften. Some careful scraping and brushing with a small bronze bristled brush takes almost all of the offending interference away. Use one of the old screws to twist into the remaining sealant that is still living in the hole and pull as much as possible out. Then carefully pick at the non-skid scoring and provide a clean surface. Soaking, brushing, picking and scraping the footprint clean. The difference from the original footprint, on the right, to the properly prepared mating surface, on the left, is dramatic. Once the mating surface is thoroughly cleaned, tape each footprint area with 3-inch masking tape and allow two-inches for a margin beyond the original. Then prepare to temporarily install the handrails in position. This requires two people, one below and one on deck. Once the rails have been located and each footprint has been screwed lightly in place; trace the unique footprint of each teak base with a carpenter's pencil, onto the masking tape. Carefully unscrew the rails and using a utility knife cut away the profile of the footprint. Next, carefully tape off and isolate each mating surface of the handrail. 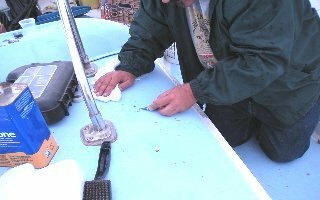 Apply the sealant to the previously drilled, "pocket" within the grab rail feet, squeeze a bit of sealant directly into the hole and then place a coat over the prepared deck surface with a depth of about 1/8". Starting at the middle screw, Install the interior rail and carefully turn the screws into the exterior rail a few turns then locate each successive hole, alternating each until each matching screw has started within a corresponding hole into the upper rail half. Begin to tighten each alternating screw until almost snug. Then repeat the sequence until about a 1/4 turn more is applied until clear evidence of sealant oozes evenly around each mating seam. Using a finger covered with a new disposable glove, smooth the area where the oozing has now become evident. The last sequence of minor tightening should be left for 48-hours, when the sealant has had time to "set-up". At this time the sealant can be cut with a sharp razor and the masking removed. As the sealant used was the polysulphide the finishing of the small seam is accomplished with a small amount of acetone on a Q-Tip to smooth and finish. The last operation is to replace the wood plugs in the screw holes of the interior grab rail. In my boat, the holes originally drilled were quite large. I was unable to find 3/4" teak replacements but I instead I used 3/4" pine plugs. These plugs were coated with a couple of light coats of polyurethane, a day before installing them, to prevent water absorption and the consequential swelling that could potentially damage the surrounding teak. They are easily trimmed flush with a sharp chisel along the grain. Once shaved to roughly level, I used a small piece of 100-grit sandpaper to conform the shape and finished the local area with 220-grit.The final refinishing was accomplished with two (almost-dry) applications of the Minwax, Helmsman, clear-satin finish, polyurethane that blended quite easily and seamlessly with the previously applied coats. The contrast of the light colored pine plugs with the teak is really quite pleasing. I have just finished repairing leaks in the teak handrail. There has been a very slow leak for a long time near one of the sites of a thru bolt. Perhaps one drop in a half hour, during rain or heavy spray on deck. But recently a new one has developed at another site. It has been a much bigger leak, and has made a brown spot about 3 " diameter in the cover of the port settee. After removing the teak plugs covering the head and tail of the bolts, I discovered that both bolts had rusted through. They were 5" x ¼-20 round head machine screws. The only similar I was able to find were at the local West shop, flat head the same size for $4.25 a piece! The bungs are 5/8" diameter and not available at West, but I have a 5/8" plug cutter so made my own for replacement. I didn’t investigate any other of the bolts, who knows how many are rusted through. Tightening the bolts is difficult as the only way to hold the nut is with a deep socket. The outside diameter of the socket is also 5/8" so it fits in the hole with difficulty. 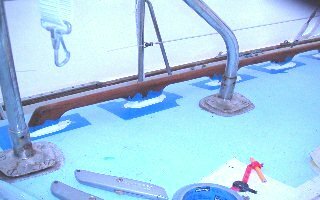 As I am relatively new to boat ownership, would somebody explain the proper technique of removing and installing them the wooden plugs that are used to cover screw and bolt heads in wooden items such as handrails and soles? My own experience, while shortening the aft end of the handrails to accommodate the forward edge of my dodger and new instrument pod, found the same problems. I simply replaced with stainless, threaded rod, an acorn nut on one side and Nylock nuts on the inside. But by cutting a slot in one end of the threaded rod I was able to lock a home-made "T" shaped "screwdriver" above and get the basic length and adjustments before getting help to hold the opposite end while tightening down. 5/8" plug cutters are available at Home Depot.